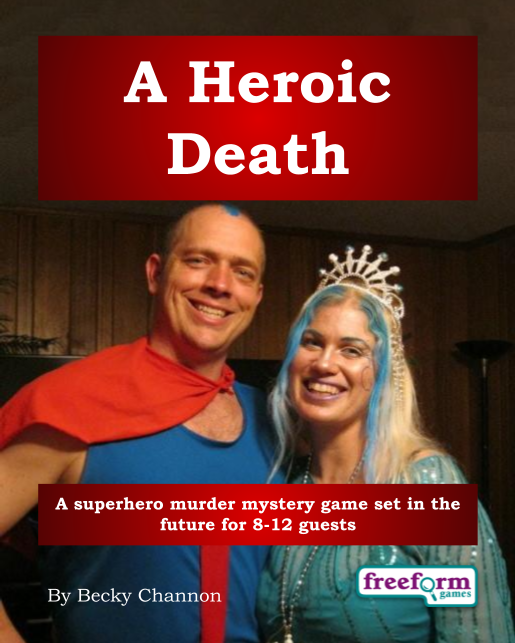 A Heroic Death is a superhero murder mystery party for 8-12 guests (plus one host) published by Freeform Games. Set in the future, A Heroic Death takes place in the SuperHeroicJusticeDoomSquad's secret base where our heroes have been locked in while the world outside is in danger. But someone in the Squad is a murderer! A Heroic Death is an interactive murder mystery game, which means that all the guests have a complete character, with detailed backstory, goals and a list of other people that they know. Characters also have item cards (representing weird objects such as strange stone tablets and mysterious potions) and abilities (that allow them to detect secrets, find out information about other people). And of course the heroes in the Squad all have their own superpower. A Heroic Death has a number of different plots to keep everyone busy. For example, there is a mysterious tablet, a missing satellite - and of course a murder to solve and the world to save! Interactive murder mystery games are so good I'm certain that once you've tried one, you won't want to play any other! Bloody Mary – Bloody Mary likes fighting villains and drinking cocktails. Captain Amazing! – co-founder of the SuperHeroicJusticeDoomSquad. Dr Robot-Neck – the squad's second in command. Ice Queen – a superhero made entirely of ice. InvisoGirl – InvisoGirl is known for her mischievous sense of humour. Miguel – the squad's cleaner. Puss-in-Boots – A talking cat. S. – The squad's newest member. Shaman – Shaman is possessed by the spirit of a powerful Native American shaman. The Masked Crusader – the squad's other co-founder. The Russian – A mysterious superhero. WhizzoGirl – the squad's spokesperson and media liaison. Instead of a formal dinner party, A Heroic Death is better suited to a buffet meal or finger food. Everyone needs to be able to talk quietly with each other - to plot and scheme and achieve their goals. A Heroic Death needs a dedicated host, someone to organise the game. A Heroic Death is available from Freeform Games for $29.99 USD. Click here to buy A Heroic Death from Freeform Games. For more information about A Heroic Death, click here to download the free introductory pdf file which includes more details - including background and a full cast list.